Some superheroes have everything in their corner to help them, but in these movies like Doctor Strange all of the characters are overcoming incredible odds. After all, what would be the fun if it was easy? Doctor Strange is an unlikely superhero as a sorcerer who has lost the use of his hands, but he is a super valuable character in the Marvel world. What other superheroes are crushing it bigger then you expect them too? Check out this list of movies like Doctor Strange. Doctor Strange is an upcoming superhero movie that is based on the character of the same name from Marvel Comics. The movie is due to hit theaters on November 4, 2016 and stars Benedict Cumberbatch in the main role. Here are some other movies like Doctor Strange. Thor is a 2011 superhero movie that is based on the character Thor from Marvel Comics. The movie focuses on Thor, a crown prince who is sent to Earth from Osgard and his powers taken from him. Meanwhile, Loki, his brother, plans to take the throne for himself. Thor stars Chris Hemsworth as Thor and Tom Hiddleston as Loki. The movie also stars Natalie Portman and Stellan Skarsgard. Ant-Man is a 2015 superhero movie that is based on the characters Scott Lang and Hank Pym from Marvel Comics. The movie centers on Scott Lang, a cat burglar who teams up with Doctor Hank Pym, his mentor, to pull off a heist in order to save the world. Ant-Man stars Paul Rudd as Scott Lang/Ant-Man and Michael Douglas as Hank Pym. The movie also stars Evangeline Lilly, Corey Stoll, Anthony Mackie and Bobby Cannavale. The Avengers is a 2012 superhero movie that is based on the team The Avengers from Marvel Comics. The movie focuses on a team of heroes on Earth who must learn how to fight together in order to stop the evil Loki and his alien army from controlling the world. The Avengers stars Robert Downey Jr. as Tony Stark/Iron Man, Chris Evans as Steve Rogers/Captain America, Mark Ruffalo as Bruce Banner/Hulk, Chris Hemsworth as Thor, Scarlett Johansson as Natasha Romanoff/Black Widow, Jeremy Renner as Clint Barton/Hawkeye and Tom Hiddleston as Loki. The Hulk is a 2003 superhero movie that is based on the character Hulk from Marvel Comics. The movie showcases the life of Bruce Banner, a genetics researcher who is involved in a lab accident involving gamma radiation, which turns him into a gigantic green monster every time he gets angry. The Hulk stars Eric Bana as Bruce Banner/Hulk. The movie also stars Jennifer Connelly, Sam Elliott, Josh Lucas and Nick Nolte. Iron Man is a 2008 superhero movie that is based on the character Iron Man from Marvel Comics. The movie showcases Tony Stark, a billionaire engineer, who was held captive in a cave in Afghan and after his release, creates a unique suit that turns him into the superhero known as Iron Man. Iron Man stars Robert Downey Jr. as Tony Stark/Iron Man. It also stars Gwyneth Paltrow, Terrence Howard, Shaun Toub and Jeff Bridges. 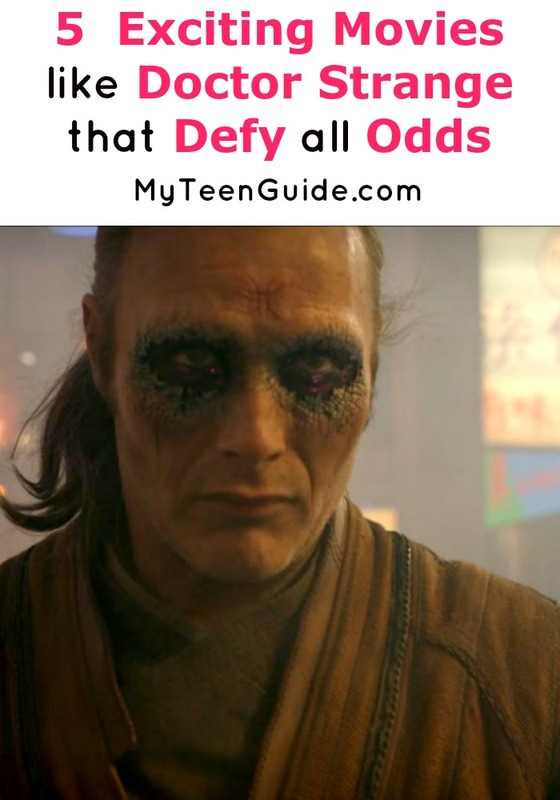 There are tons of superhero movies out there, but this list definitely has main characters who are winning against all odds. What other movies like Doctor Strange do you think could be added to this list?